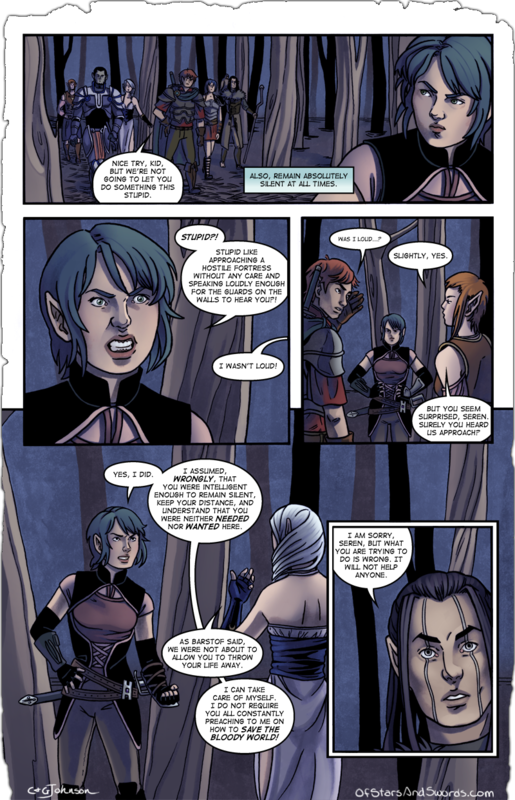 Of course, the downside to Seren’s insistence to take her time to survey defenses and find a way to sneak in is that it gives certain other people time to catch up to her and be difficult. We would also like to apologize for Seren’s desperate need to have a teenager-styled outburst at the moment, but hopefully she’ll get over it and we’ll all stop wanting to strangle her! I mentioned last week that the prose pieces were going to find a home this week, and I was sadly a week off. Next Wednesday will see the launch of a prose subsection to the site, with all of the old histories and Cato’s story from the old blog posts. They’ll be compiled and in an easier-to-read format, along with new updates to Cato’s story again! The only thing holding the site back at the moment is some CSS difficulty. The header is giving me some trouble and not wanting to cooperate, but one way or another we’re launching the prose stuff next Wednesday! It has been too long without it.